Criteria for the selection of judges should be objective and the selection process should be transparent in order to secure the independence of the judiciary. It would be natural to assume that the authoritarian governance in Estonia from 1934 to 1940 affected the independence of the judiciary. The article discusses criteria that were applied to the selection of judges during that period, how objective the criteria were and how transparent the selection process was. 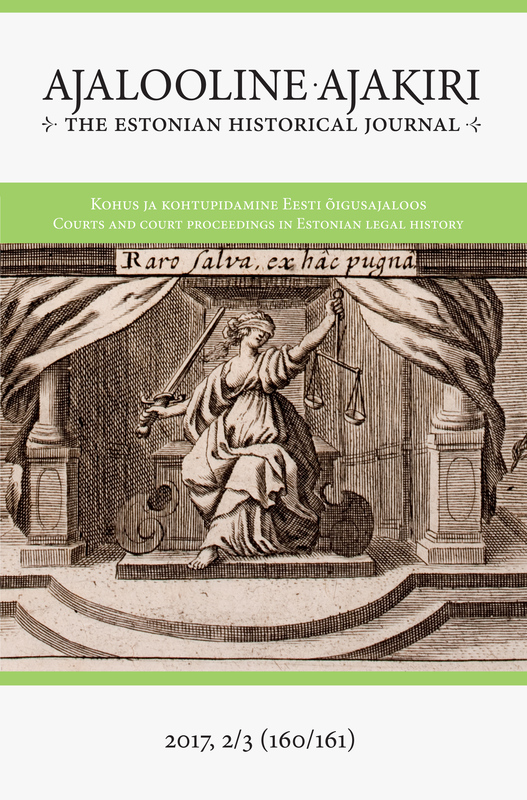 In 1934, there were 166 judges and investigating judges in three levels of the civilian courts in Estonia. This figure increased to 176 by the summer of 1940. There were close to 170 vacancies for judicial offices during the researched 6.5-year period. The process of application for vacancies, review of applications, and selection of candidates for appointment was prescribed by law and Supreme Court regulations. Judges were appointed by the head of state (the Prime Minister, later the President of the Republic). The head of state had a choice between two candidates (three from April of 1938) selected by the plenary of the Supreme Court. From 1938 onward, the President of the Republic could request up to three additional candidates. Before selecting the candidates, the Supreme Court consulted with lower courts and reviewed opinions given by the plenary of either the Court of Appeal or Circuit Courts. The process of selection was generally well documented. In around 80 per cent of cases, the head of state in 1933–40, Konstantin Päts, chose the first name on the list. In cases when he selected the second or third candidate, he did not explain his choice. There was an average of 6.4 candidates per vacancy during the researched period. The option introduced in 1938 of choosing from up to six candidates theoretically gave the executive branch the opportunity to select almost any applicant for the vacancy. In practice, Konstantin Päts required additional candidates only once, in January of 1940. Candidates had to meet several written and unwritten criteria. The law prescribed that Estonian citizens at least 25 years old with higher legal education could stand as candidates. Previous experience as a judge, prosecutor or lawyer ranging from four to ten years was required in most cases, and candidates had to have a clean criminal and personal solvency record. Unwritten criteria derived from the nature of the work of judges and from the text of the judicial oath. The latter required honesty, impartiality and loyalty to the Constitution. The unwritten criteria related to the qualifications, skills and capacity of the candidates (such as diligence, social communication skills, independence, addictions, health condition, Estonian language skills and even academic achievements) or to their integrity. In the selection process, all the unwritten criteria were applied. When a judge applying for a vacancy had some issues with the criteria (e.g. was deemed too slow or ineffective, not independent enough, or not smooth enough in communication), his progress was usually slower. Nevertheless, judges were always preferred over external applicants, with the exception of prosecutors. Prosecutors and judges had equal opportunities to be selected, while lawyers and notaries were left aside in the selection process. The ethnic origin or political views of the applicants were sometimes reviewed, but they did not play a major role in the selection process. Few ethnically non-Estonian judges (Russians or Germans) were turned down because of their weak Estonian language skills. As the research period begins with the coup staged in 1934 by Konstantin Päts and his allies against the League of Veterans’ of the Estonian War of Independence, the fate of judges who supported the League is of special interest. League members expelled from the judiciary or preparatory service of the judiciary were never selected. However, judges who were once members or supporters of the League, were selected and appointed to higher posts. In summary, the applied selection criteria were generally objective and there was no discrimination on grounds of ethnic origin or political views of judges applying for vacancies. While the selection process was transparent, the appointment of judges (i.e. selection from among the last 2–3 candidates by the head of state) was not.